Worm tea equals pure liquid gold. Also referred to as worm juice and worm wee. There’s no doubt worm juice makes an excellent plant fertilizer. It is also a natural insect repellent and improves soil health. Worm tea is far superior to chemical fertilizers. Chemical fertilizers contain pesticides and herbicides, burn the soil and kill beneficial microbes. Worm tea is free and easy to make at home. All you need is a couple handfuls of worm casting and a bucket of water. It’s a great way to boost your garden. Worm tea in a bucket ready to use. into other forms so that it can enter the food chain. Worm tea contains a higher count of good bacteria. Bacteria puts nitrogen back to the soil; making it available for plants to absorb. Manure and worm castings are slow to release nutrients. Liquid fertilizer makes nutrients immediately available for plants to absorb. Worm juice can give plants an instant boost that is quicker than applying worm castings. Worm tea boosts microbiological activity in soil by adding bacteria. Try to avoid chlorinated water as this can kill off some of the beneficial bacteria. Making worm tea using a sock full of worm castings to steep in a bucket of water. 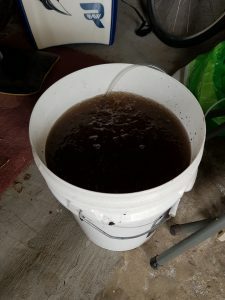 Worm farm leachate – This is excess liquid which you can collect from the bin (seeping). Note there should never be any liquid run off in a well maintained worm farm. However, sometimes it can be unavoidable. Worm farm leachate ca be high in ammonia which is toxic to plants. Therefore it is important to dilute worm farm leachate with water; 1 part worm tea to 10 parts water. Is it debatable whether worm farm leachate is good or harmful to plants as a fertilizer. 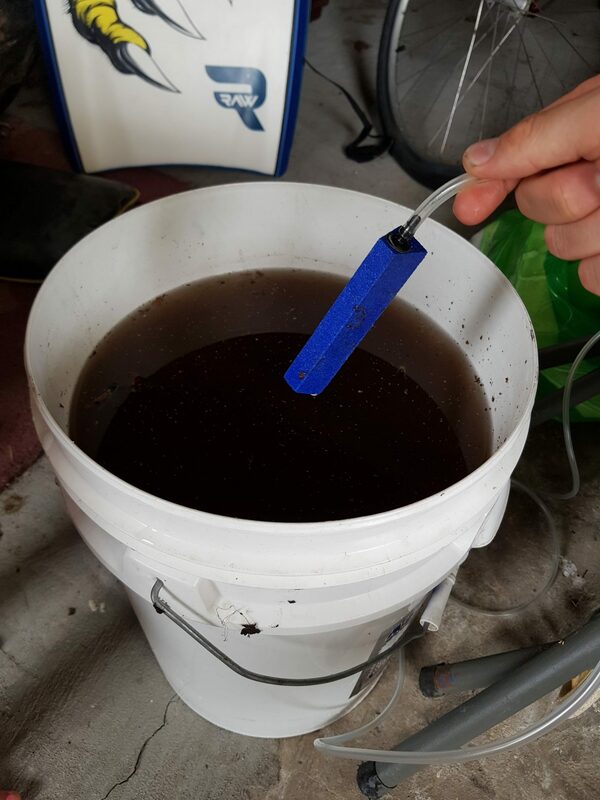 Wet mixing – This involves mixing water with some worm castings (steeping). A common method is to put worm castings in a thin mesh or pantyhose, and to submerge it in water (like a tea bag). Nutrients and minerals in the worm castings will dissolve in water. Leachate is liquid run off at the bottom of your worm bin. Worm tea requires human intervention to steep worm castings in water. Not all bacteria in the bin are good. When conditions are not right, bad bacteria will outnumber the good. This can cause harmful toxins and pathogens to be present in leachate. Leachate can be acidic, anaerobic, and lacking in the beneficial microbes. So be cautious with worm farm leachate. Worm castings on the other hand are a finished product. Conditions are much more stable to use as a base for making worm tea. 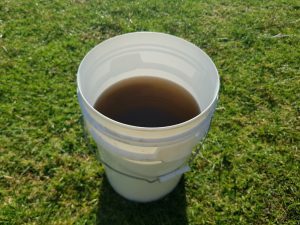 Here’s an excellent article which compares the differences between worm tea and leachate. 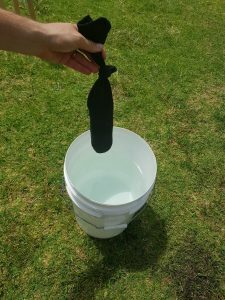 Bucket full of de-chlorinated water (e.g. rainwater, pond, or distilled water). Handful of worm castings. 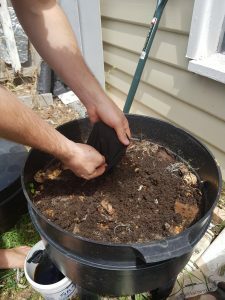 Don’t overthink the ratio of worm castings to water. Steep worm castings overnight in bucket of water. Optionally enhance the concoction by giving it more oxygen (aerobic method). This will encourage the bacteria to grow and increase microbial activity. Some people cleverly use a fish tank air pump to achieve this. Your worm tea will be good to use after a few days. The water should be a light brown color. Adding a continuous supply of oxygen will significantly increase the number of good microbes in the worm tea. 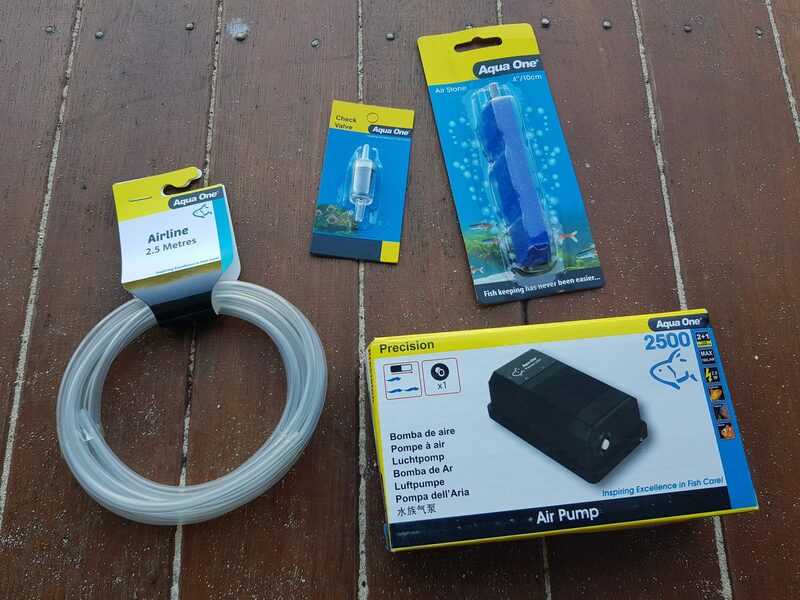 In order to oxygenate worm farm tea at home, you’ll need a fish tank air pump and some accessories. 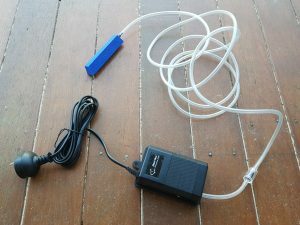 Accessories include an air stone, return valve and some tubing. This should cost you less than $20USD total to buy. Once the mixture is ready to brew, drop the air stone into the bucket and let it bubble overnight. Fish tank air pump connected with accessories ready for making quality worm tea. Drop air stone and let it bubble overnight to make worm tea. 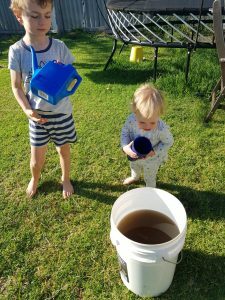 I have some helpers to fertilize the garden using worm tea! Don’t be shy to cover whole plants including leaves with worm tea. It is a natural insect repellent and helps to fight harmful diseases (like black rot, mildew etc…). I like to scoop the liquid fertilizer into a cup and pour over the plants. You can also use a watering can or a spray bottle. If you use a spray bottle, remember to strain the mixture first. Otherwise small clumps might build up and block the nozzle.